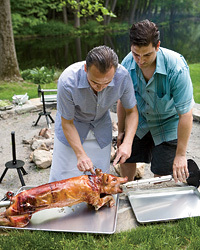 Jean-Georges Vongerichten followed the spit-roasting instructions on SpitJack.com; here’s our streamlined version. On a nonflammable surface, such as brick, cement or gravel, build a 6-by-2-foot hardwood log or charcoal fire. Rig a 20-pound suckling pig onto a spit fitted with a spit fork to grip the rear haunches. Using a heavy-duty trussing needle and twine, tie the pig to the spit behind the head and close to the tail. Stuff the belly with 10 crushed garlic cloves, 5 rosemary sprigs and 5 thyme sprigs. Using a small trussing needle and twine, sew the belly shut. Brush the pig with olive oil. Mount the spit on its tripods so that the spit stands 1 foot off the ground, just to the side of a long edge of the fire. Lay two disposable aluminum roasting pans or two sheets of heavy-duty foil under the pig to catch the drippings. Turn on the spit. Set an oven thermometer on an upturned cinder block close to the pig. The ambient temperature should stay between 225 and 250. Add a layer of fresh coals every 30 minutes, as needed; although you will likely use 20 pounds of coals, it’s a good idea to keep up to 60 pounds on hand. Roast the pig for about 2 hours, or until a meat thermometer inserted in the thickest part of the shoulder and rear haunch registers 145. Remove the spit from the heat and let the pig rest for 30 minutes. Transfer the pig to a large work surface lined with heavy-duty foil. Untie the pig from the spit. Discard the twine, peel off the skin, carve the meat, sprinkle with fleur de sel or sea salt and serve.